The New Generation Series of axial roof units are fitted with adjustable pitch impellers enabling a wide performance range to be obtained from any one unit. 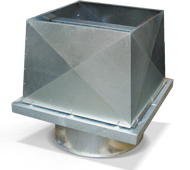 Galvanised steel base, windbands are galvanised steel. Impeller blades can be GRP, nylon, aluminium or anti-static to suit the application. Shutters are fitted as standard to RVE units. Ensure that the flap hinge points down the slope of the roof. Electricity supply - 220-240V single or 415V three-phase to suit a wide range of voltages and frequencies. Motors are selected to suit the application and can be provided with 2-speed windings. In addition, motors to meet Ex d, Ex e, Ex n or D.I.P. Standards can be fitted. When fans are required for smoke-spill applications this must be nominated at the time of enquiry. Thermistors can be provided on all motors except where Standards specifically exclude their use. Up to 1000mm diameter - BS848:Part 1, 1980. Noise testing is based on tests to BS848:Part 2, 1985. Wide range of capacities and motor options. Comprehensive noise data for intake and discharge is available on all selections by referral to our sales office. Designed for use in applications ranging from clean air to smoke spill. The New Generation RSS Series of smoke-spill fans has been fully tested to meet the air performance and high temperature test requirements of Standards AS/NZS1668.1:1998 and AS4429:1999, both tests are mandatory. An additional requirement of the Standards with respect to unsprinklered buildings (300OC @ 30 mins) and relating to the operation of the discharge dampers has also been met. The fail-open discharge damper latches come in two forms; the first being a manual release type requiring manual closing after the fan has been run. The second design, an electro-mechanical type, permits the shutter latch to release and close automatically after the fan stops. Fantech has applied for patents for both designs. For advice on smoke-spill wiring requirements refer to the above Standards.